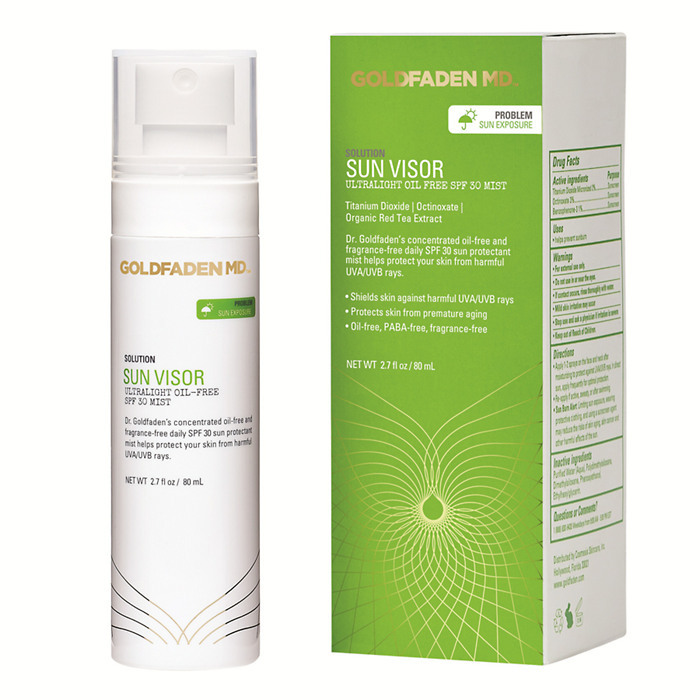 Last Saturday I posted this review about Goldfaden MD’s Sun Visor product. Understandably a lot of their customers that read the blog were concerned and I started receiving worried messages and comments immediately via my social media channels. After two of my readers, Sarah and Jaquie, left comments with replies they had received from both Goldfaden and Space NK to their queries, I emailed the UK PR and reiterated my offer of letting Goldfaden use this platform to respond to my review, which I thought was only fair. Below is Goldfaden’s response (complete with their own capital letters/punctuation) with my further comments below them. Happy to clarify. My apologies. 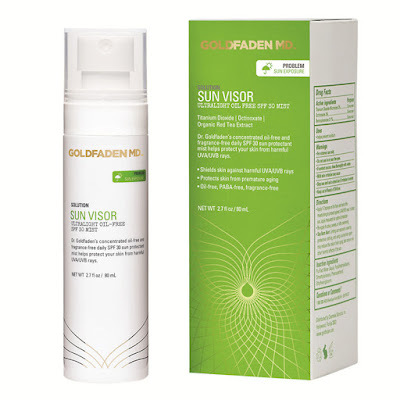 Goldfaden have added the term non-nano to their website here, which should comfort their customers that can simply google ‘titanium dioxide micronized’ and see for themselves that industry thinking is generally that the term micronized equates to ‘nano’. Micronized TD is a particle of an average of 15nm and thus it is considered a nano-sized particle. No confirmation from Goldfaden on the size of their particles. This is why a lot of ‘green’ brands specify ‘non-nano’ on their packaging. Perhaps something for Goldfaden to consider on their next repackaging to avoid any possible confusion in stores? Note however, that Proposition 65 refers to ‘airborne titanium dioxide, unbound particles of respirable size’, it makes no mention of nano. And it’s not on the Goldfaden website ‘out of respect to California state residents’. It’s the law. common sense when applying any topical agent on the face. Whether it’s clear on the packaging, or it’s ‘intended’, this is the message taken directly from Goldfaden’s YouTube channel. 36 seconds in – two spritzes to the face, two to the neck. If they think that offers enough protection, so be it. That’s their opinion, it’s their brand and their product. It’s personally not how I would advise applying SPF, or how much I would suggest using to be fully protected, but it’s only fair to show what they mean. These ingredients are sourced from natural sources (ie. apples, raw cabbage and pumpkins) and are used in the development and refining of the final product formulation. These are used in trace amounts and are inactive, however these are disclosed on the label by inci name. I know they’re disclosed on the inci. I’m the one that pointed it out. The type of silicone isn’t the issue. I personally like silicones, as regular readers will attest to. The point is that they’re silicones. Silicones don’t magically appear from fruit. It’s a chemical process. My concern was simply that they were in a product claiming to be ‘silicone-free’. *Net-A-Porter emailed me first thing on Monday morning to say ‘thank you for bringing this erroneous silicone mention’ to their attention and that they have changed the copy on the product page accordingly. I have of course altered the original review to reflect this. Thank you for the kind words NAP. Thank you for highlighting. This is a typo. We have addressed in reprinted packaging. No explanation on whether the product used to contain zinc oxide and when it was removed, or how long it has claimed to include zinc oxide when it actually doesn’t. Goldfaden aren’t clear on whether or not I received out of date packaging or if the product is about to be repackaged. Personally? Simply claiming it’s a ‘typo’ would not be good enough for me if I purchased this in good faith because I wanted a product that contained zinc oxide. An eagle-eyed reader called ‘prune’ left a comment on the original blog post asking where the red tea was on the inci list. I hadn’t even noticed that. I assume that will also be added on the new packaging, as it has now been added to the ingredients listing on the SpaceNK.com site. Honestly? This has been the most unpleasant and unprofessional experience of my blog life by far. From my perspective? This has been a reminder for me that it is not always easy putting your name out there and actually having an opinion. I have never been, nor will I ever be, a ‘press release’ blogger. I ask questions. That makes some people uncomfortable. Some brands and PRs react brilliantly to that, others get defensive. I will always say when I am wrong, correct it and apologise if necessary. I will always be open to constructive criticism. I teach my kids to OWN IT. FIX IT. MOVE ON. For my part, I have owned it and fixed it. I am moving on.